ComScore is an internet analytics company providing marketing data to many of the world’s largest enterprises, publishers, and agencies. Their primary optimization goal is to increase the quantity and quality of enterprise leads for their sales team. As comScore’s Director of Web Marketing, Ferry Gijzel is always looking for new ways to build on their online business. His team is responsible for optimizing to drive a high volume of leads to comScore’s sales team. When deciding what to test, he focuses primarily on each page’s content and design, building hypotheses based on web analytics, user interaction analysis, or audits against the latest B2B industry best practices. During a recent audit of comScore’s website, Ferry found that leads generated from comScore’s software product pages – measured by total demo requests – were lower than expected. He wanted to find a way to optimize these pages to drive more site visitors to comScore’s sales team. Ferry hypothesized that improving brand validation and social proof would increase the number of leads generated from comScore’s product pages. To test his hypothesis, Ferry opted to put greater emphasis on client testimonials – hoping improved validating factors would remind site visitors that comScore’s software tools were also adopted by brands they know and trust. 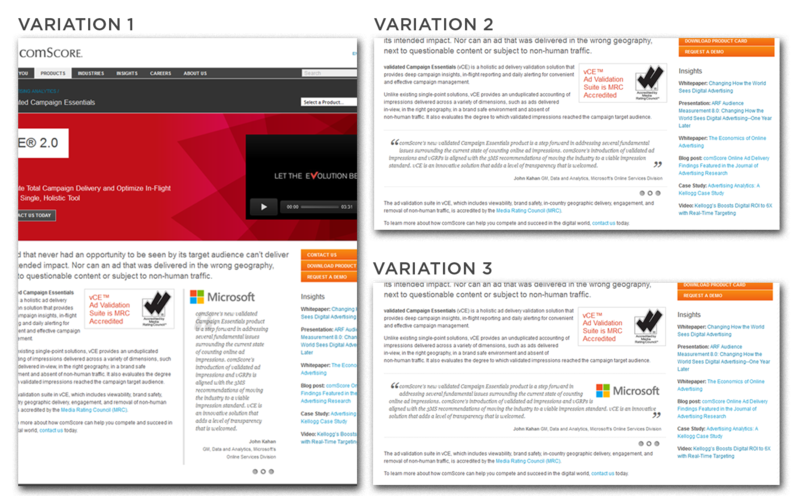 Ferry and his team built an experiment testing three variations of client testimonials against the original. Each variation tested design orientation and logo placement. The original product pages displayed a vertically-aligned customer testimonial and no customer logo. Approximately 2,500 site visitors were entered in the experiment, with traffic divided equally among each variation. Ferry and his team tracked several engagement, click, and pageview goals, with the primary conversion goal being views of the “Demo requested” page. This page was displayed after a site visitor successfully signed up for a comScore demo, making them a new lead for the comScore sales team. Integrating Optimizely with comScore’s Digital Analytix tool helped Ferry apply custom segments and filter the experiment results to analyze how each social proof variation performed for clients versus prospects. Filtering out existing clients from the test results gave Ferry a clearer picture of how the test was performing in terms of new leads generated. The vertical testimonial that included a logo outperformed all the other variations – increasing leads generated by 69%. Ferry applied user segments to zoom in on experiment results for the target group for his test – new leads. “We wanted to filter out all existing clients who only use the page to login to the product and focus on the effects the changes had on prospective customers,” he said. Drilling into specific user groups can provide more detailed insights from test results and can shape ideas for future tests. Not every test needs to be drastic, like a website redesign. Testing minor differences to the social proof display on comScore’s product pages yielded a significant lift in conversions. When building experiments, test both large and small aspects of your site to maximize conversion rates across the board. Ferry used Optimizely to track several types of conversions on comScore’s site, setting goals around engagement, click-throughs, and pageviews. 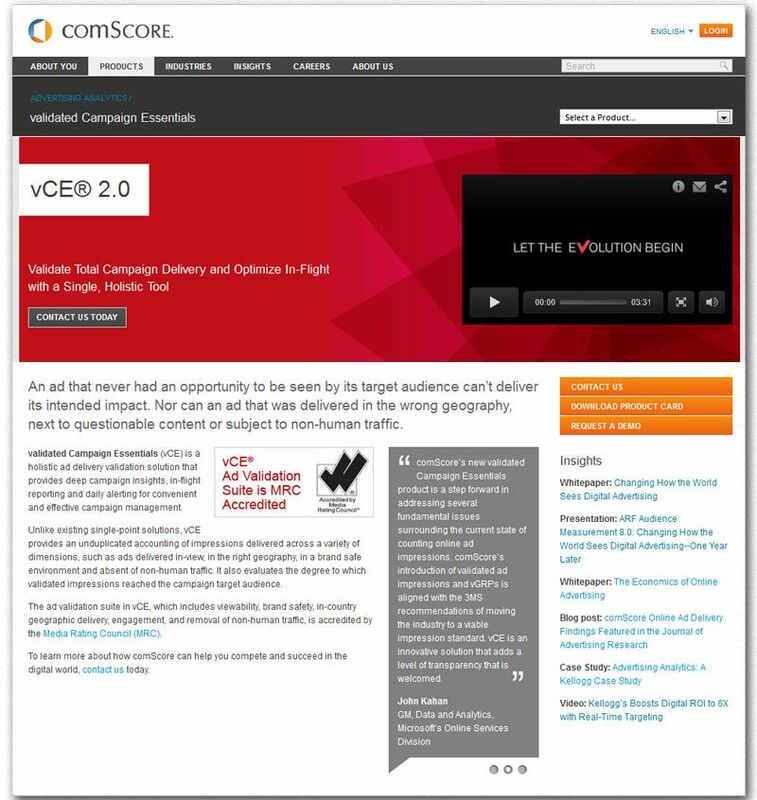 Tracking both macroconversions (actions that directly drove comScore’s lead generation, like views of the “demo requested” page) and microconversions (actions that revealed more nuanced information about site visitors’ behaviors, like engagement) for each experiment can help paint a fuller picture of how users interact with your site and inform future experiments. Optimizely makes building and running A/B and multivariate experiments fast and easy, which enables us to run more tests and optimize our site at a higher pace. Jetzt ist die Gelegeneheit. Wo wollen Sie digital experimentieren?